Something else I've heard lots about but never tried. I thought they'd be good for a Sunday morning breakfast. Add the melted butter to a cup of milk and heat (either in a pan or microwave) until they're lukewarm. Add the yeast and stir until it dissolves. In a bowl, sift together the flour, sugar, salt and cardamom seeds. Add the milk/yeast/butter and form into an elastic dough. Leave to rise for 30-40 minutes. Soften the butter and add the sugar and cinnamon to form a spreadable paste. Knead the risen dough for 2-3 minutes and then roll out into a large rectangle. Spread the cinnamon paste all over the rectangle. Roll the rectangle up starting with the widest edge until you have a sausage shape. Cut it up into 15-20 inch thick rolls and place on a baking tray inside a muffin case. Leave them to rise more for 20-30 minutes. Brush with the beaten egg and sprinkle with a pinch of sugar on each roll. Bake for 10 minutes at Gas Mark 7. I've never been a fan of cinnamon before but these were really delicious. I had one while they were still warm and it was soft, squidgy and really light. Fingers crossed the kids like them because I've got 20 of them tempting me now! I've never tried this cold soup but heard that it's delicious. I'll soon find out! Take the seeds out of the cucumber, peppers and the tomatoes. Save a bit of pepper and cucumber for the garnish. 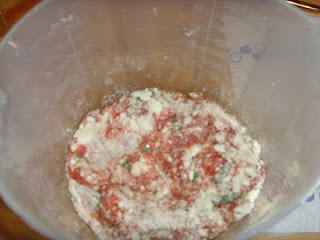 Then just put everything into the blender/food processor. Blend everything until it's liquidised. Season with salt and pepper then chill it in the fridge for at least an hour. After it's chilled sufficiently. Garnish it with diced cucumber and pepper you saved earlier. You can also add chives or parsley. I used parsley and ate it with a crusty bread roll. It was a lot tastier than I expected. I really enjoyed it. It'd be a great dish to serve in the summer. My boyfriend is from Tennessee so I've already tried this southern breakfast food. I decided to make this for my Dad to try, to reward him for coming over to fix my back gate. Combine the flour, baking powder and salt in a bowl for the biscuits. Cut the butter into small cubes and add to the bowl. Rub the butter into the flour using the tips of your fingers. If you use your hands the butter will melt too fast and it won't work. The aim is to make the flour look like breadcrumbs and for all the butter to be in the flour. Next, add the milk and stir with a metal spoon until all the mixture clumps together. Now you can get your hands in there and knead the mixture together gently. Form into a ball and take out of the bowl onto a floured surface. Roll it out and cut into circles. You can make around 12 biscuits with this recipe. Place the circles onto a greased tray and put into the oven for 15 minutes at Gas Mark 7. Now it's time to make the gravy. First take the skin off the sausages and break them up into small pieces. I rolled mine into little balls. Cook them in a pan until cooked and browned. Take them out of the pan onto some kitchen paper to drain. Add 1-2 tablespoons of lard to the pan, depending on how much fat drained from the sausage. When it's melted, add 3 tablespoons of flour and stir. Slowly add the milk a bit at a time stirring constantly. The gravy will thicken up as you keep stirring and adding milk. Once it's to a thicken you like, add the sausage balls and salt/pepper to taste. Put 3 biscuits onto a plate and spoon over the sausage gravy. Then enjoy! Even more meat, from Algeria this time. Brochettes can be any meat you like. Liver is use a lot too apparently but I opted to use beef. Combine all the marinade ingredients together to make a paste. Rub it all over the beef, cover it with clingfilm and put it in the fridge for an hour (or longer if you have time). Next, thread the vegetables and meat onto skewers to make as many brochettes as you'd like. Then grill or barbecue the brochettes until the meat is cooked and the vegetables have softened. I served mine with rice and a barbecue/tomato sauce. I was impressed with the tangy taste of the meat in this recipe. The lemon juice tenderised the meat and gave it nice fresh taste too. The chilli made it spicy but not too much. Will definitely do these in the summer for a BBQ. 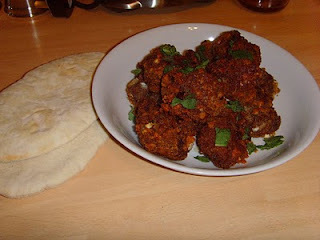 More meat, this time it's chicken the Afghan way. The day before you want to eat the chicken you need to combine all the ingredients (except the chicken) together into a bowl. 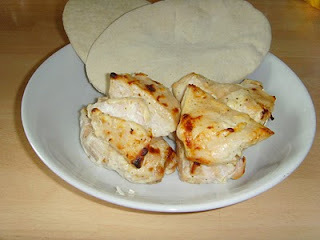 Cut the chicken breasts into big chunks and add it to the yoghurt mixture. Mix the chicken in so it's covered well. Cover it with clingfilm and put it in the fridge overnight. When you take the chicken out of the marinade the next day, wipe off the excess yoghurt and then grill for 6-8 minutes on each side until cooked. That's what happens in an ideal world, in my world they aren't cooked through after 10 minutes on each side and the smoke alarm goes off! After turning the alarm off, I put the chicken on a tray in the oven for 15 minutes. Then they were cooked. They're usually served with plain yoghurt and flat bread or pitta. I opted for the pitta. The chicken was really moist and tender. After I sat down I thought of how good it'd be inside the pitta with some salad but it was also delicious just on it's own like that. Glad to have gotten my first semi-disaster out of the way! I was really looking forward to this one as I've never tried corn bread before. Heat butter and oil in a pan. Add onion and green pepper. Cook on a medium heat until they're soft. Place onion mixture in a food processor. Add 1.5 cups corn and cottage cheese then process until almost smooth. 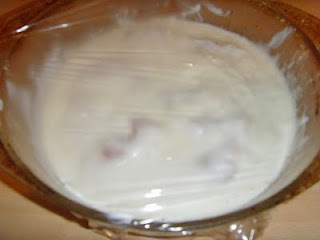 Place pureed mixture in a large bowl. 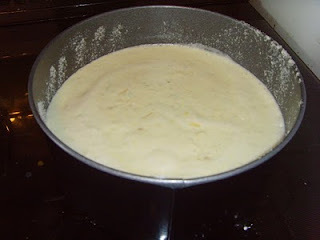 Stir in remaining 0.5 cup corn, cornflour, cheese, milk, salt, and black pepper. Place egg whites and cream of tartar in a large bowl. Beat until you get a stiff peak. Carefully stir the egg into the puree a bit at a time until it is all combined. Spray a round 9 inch cake tin with the oil and sprinkle Parmesan around it. Pour the mixture into the tin. Bake at 400°/ Gas Mark 6 for 30 minutes or until a wooden pick poked in the middle comes out clean. Cool in the tin for 10 minutes on a wire rack. Then tip it out to cool further. Cut into slices/squares/chunks and eat with butter spread on it! I was totally unprepared for how good this would be. It was soft and sweet and crumbly and so so delicious! The butter melted into it, it was literally heaven. Now I'm worried about eating the whole thing since the kids were put of by the corn in it! Time for some meat and what could be meatier than balls made of meat. I'm almost embarrassed to type out this recipe because it's so easy! Combine all the ingredients in a bowl (except the oil obviously) and mix. Roll the mixture into whatever sized meatballs you'd like. I did mine about an inch in diameter. 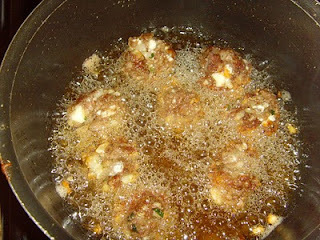 Heat the cup of oil in a pan and when the oil is ready (you can tell by putting a tiny bit in and seeing if it 'fizzes') fry the meatballs in batches of 6 (or however many fit comfortably in your pan). I served them in a bowl with a bit more mint ripped up on top. They were moist enough inside to eat on their own but they'd also be great with a sauce too. I really enjoyed them. They were really crispy on the outside and the feta cheese was still soft and melty on the inside. I'll definitely be making them again, probably for my boyfriend JD to try since he loves meatballs. I decided to start with a pud and these banana doughnuts looked easy to make. * Vegetable oil for frying. Mash the two bananas. I used my hands to mush them up because it stuck to the spoon. Mix dry ingredients in a separate bowl. Combine dry ingredients with the banana mush and fold the mixture (don’t mix or use a mixer). Add the water to make the folding easier until there are no more ingredients that are dry. Heat oil in a pan, oil should be deep enough to cover the size of doughnuts you want to make. Add the mixture with a wet spoon when the oil is hot. I used a tablespoon which made them a nice size. They float to the top of the oil as they start to cook making them easy to flip over so you can see how well they're cooking. I made 6 at a time and then drained them on kitchen paper to get rid of excess oil. Me and my daughter Leigh ate them with vanilla ice cream with golden syrup drizzled on top. They were really delicious. Crispy on the outside but soft and doughy on the inside. They tasted quite subtly of banana which is good because they're not my favourite fruit. Now considering a move to Samoa!